Bring some Spotlight into your autumn! As evenings become longer and longer and the weather allows us not go outside, take the opportunity we offer with the latest CMR Spotlight. 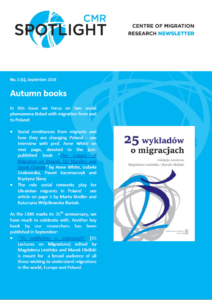 Choose between the interview with Prof. Anne White from University College London, School of Slavonic and East European Studies around the book which has just been published (The Impact of Migration on Poland. EU Mobility and Social Change by Anne White, Izabela Grabowska, Paweł Kaczmarczyk, and Krystyna Slany; UCL Press) and the short report with the results from the study on the role of social ties in integrating Ukrainians in Poland by Marta Kindler and Katarzyna Wójcikowska-Baniak. Or just have both of them. Enjoy your reading!